The year 2019 began in a very severe context. On the first day after the inauguration, President Jair Bolsonaro issued MP 870, whose measure dismantles FUNAI, the agency responsible for the Brazilian State’s indigenous policy, transferring it from the Ministry of Justice to the newly created Ministry of Women, Family and Human Rights, commanded by Minister Damares Alves. This same measure removed the attributions of indigenous land demarcation and environmental licensing in the indigenous lands of FUNAI and handed over to the Secretariat of Land Affairs of the Ministry of Livestock and Supply-MAPA, under the control of the ruralist group. There followed a series of attacks and articulated invasions against indigenous lands, persecution and expression of racism and intolerance of our peoples and our lives. 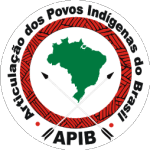 Lastly, the announcement by the Health Minister, Luiz Henrique Mandetta, further aggravated the dismantling, when he announced changes in indigenous health care, aiming at municipalization, with a clear intention to dismantle the National Policy on Health Care for Indigenous Peoples (PNASPI). leading to the extinction of the indigenous health subsystem, an historic achievement and result of many struggles of the indigenous movement. It whithin this context that the 15th Free Land Camp takes place. A space that will require of us reaction with wisdom during the three intense days. 1. The ATL will take place from April 24 to 26 in Brasilia. The location will be informed later. 2. The arrival will be on the evening of the 23rd and the morning of the 24th. It is important that all the delegations calculate well the travel time not to arrive before and not much later. 3. All participants need to bring their camping kit (tent, mat, blanket, cups, cutlery and toiletries). This material will not be available this year. 4. Each delegation, state or region, must bring non-perishable food and whoever can bring their kitchen to prepare their own food. 5. Whoever takes daily or continuous medications, bring your full medication. 6. Each delegation should present people to join the cleaning, safety and health teams for the sake of our own space. 7. No extra-shedule activities will be permitted within the ATL space, whether it’s saling, debates, hearings, or commemoration wise. 8. We will jointly build and jointly watch over our mobilization of struggle. 9. The mobilization will take place in Brasilia, but we advise that each state and region that can, also carry out local mobilizations. Indigenous blood no more droplets!